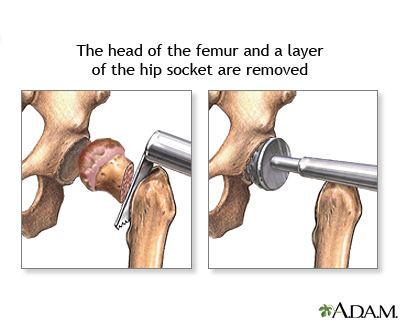 If a hemi-arthroplasty is performed, either the femoral head or the hip socket (acetabulum) will be replaced with a prosthetic device. You will receive an extensive pre-operative evaluation of your hip to determine if you are a candidate for a hip replacement procedure. Evaluation will include assessment of the degree of disability and impact on your lifestyle, pre-existing medical conditions, and an evaluation of heart and lung function. The surgery will be performed using general or spinal anesthesia. The orthopedic surgeon makes an incision along the affected hip joint, exposing the hip joint. The head of the femur and the cup are cut out and removed.